Thanks a lot for the compliments, guys! I’m happy with the way it’s turning out so far in spite of a few hiccups. As you probably noticed in my last post I was able to get the coin door installed. It’s an original Coin Controls over/under that I found on eBay in really good shape. All I had to do was give it a nice scrub and install new bezels and reject buttons I bought from Twisted Quarter. I whipped up the reject button inserts by modifying one that I found over at the KLOV forums in this thread. It’s a little difficult to make out in the picture, but I put felt over the batons that the monitor glass lays against to keep it from getting scratched. I originally used the “loop” side of adhesive backed Velcro, but it was a little too thick and made the glass push too hard against the speaker panel. After taking that off with Goo Gone, mineral spirits, and 30 minutes of immense frustration , I cut strips of felt the width of the batons and adhered them with some spray adhesive. The glass lightly butts up against the speaker panel which is what I was going for. I also installed the control panel clamps. Oh, and how could I forget the arduous process of painting the sides lol. It took about 5 coats of primer to get the sides smooth. There were a handful of grooves that had to be smoothed out. That’s what I get for using cheap ply from Home Depot. Next time I’ll fork over the extra $$ and get better quality sheets. The sheen isn’t perfect, but it’s smooth enough for side art – that’s all I care about lol. So here’s what she looks like at the moment. Try to ignore the slurpee straw and furniture movers under the feet lol. Next up, paint the inside of the monitor glass and start on that marquee. On the coin inserts, how about "Use Force to Eject"
How were you able to get the buttons apart? I have 2 new ones and I'm unable to get them apart after prying the "release tabs"
I had to use 2 very small screwdrivers. I would get one side open a bit, put something between the 2 pieces, then open up the other side. It was definitely a struggle. The tabs from one of the original ones that came with the coin door broke trying to get it apart, so be careful. I'm sure they were brittle from age, though. If I end up changing the inserts, I'll take pics of how I get it apart. Although you'll probably have figured it out by then lol. Lol good idea. What do others think? Should I leave it with the traditional "push to reject" or change it up? I like leapinlew's idea. You already have the Star Wars logo so may as well go the whole hog and change the wording too. I was able to take apart one of my original Atari units fairly easy, not so much luck with the new ones I purchased. At least now I can scan in the OEM Atari and make a matching image. Once I scan it I'll upload for everyone. This is what I was thinking when I woke up this morning! I know, pathetic it's like one of the first things I think of lol. Force Push was what I originally thought too, but I felt it bordered on too geeky. Yeah I think you're probably right, and I don't know if the term "force push" was a thing back in Star Wars' early days. I'm a Star Wars fan but not a super fan. I have an upright Star Wars cabinet in my collection (it's one of my grails). The first time I remember force push was when I played Dark Forces in 1995. I'm seriously jealous. It's funny, even being a big SW fan I never liked the original game when I was a kid. I did like playing Empire on my Atari, though. I think "force push" is too much a "modern" SW term for this build. Although you'll probably have figured it out by then lol. A bit more muscle was required, I practice on an old one first. The results.. well worth the effort. 1. Do you know how thick the plexi is that brad uses? 2. Since the vinyl is adhered to the plexi, do I need 2 pieces, or just the one that it's attached to? Never mind, I emailed Brad and he got back to me like within an hour. Another reason I HIGHLY recommend ordering from him. For reference, what were the answers? His reply was, "The thicker it is the better it looks...I'd go 3/16" if you can." I'm assuming you don't need another piece of plexi since the reverse printed screen is adhered to the one he provides. I'm going to install the retainers with 1/4" allowance to be safe. Hi guys, sorry it's been such as long time since my last update. Life has been crazy and I was addicted to the new Zelda game for about 2 months lol. Anyway, I special ordered these angled aluminum pieces to use as my marquee retainers. I spray painted them black, but still need to drill the holes for the hardware. I think they'll look nice. I took a photo with the TV on, but it doesn't show the difference that's noticeable in person. I'm happy with the result. I've been working on the artwork here and there. I haven't gotten very far, but I'll post a what I've got once I have something to show. This project looks really cool. I'm excited to see what you create for the side art and marquee. Well, I guess I won't be using photobucket anymore lol. I'll go through the rest of the thread and fix the pictures and hopefully have some updates soon. I've been dying to get back to finishing this but a kitchen renovation and handful of other things over the summer have taken every bit of spare time. I have been working on the artwork. It's just taking me forever cause I can't draw better than my 7-year-old son lol. Thanks for fixing your pictures - I love this cab, and I think this thread is one of the important references on this forum for how to design around a 16:9 LCD panel right. Good luck on getting back to this soon. I just stumbled upon this project, and wow what you've shown so far is excellent, especially your graphic design and layout of the control panel! I hope to see future updates on this great cab to be. Ok, finally update time. Here's a couple versions of what I have for my side art so far. They're pretty much the same save the logo in one of them. I know, most cabinets don't have their logos on the side, but I thought it might need something up top so the art wasn't so bottom heavy with the death star and x-wing. You'll notice that I drew heavily on some of my favorite cabinets, particularly the original Star Wars stand-up (I straight up ripped off the aura around the death star, and the outline/surround is very similar), Xevious, and even Echo Base by DrChek. I wanted to add something to the Logo like "classic arcade machine" or something like that, I just haven't thought of a way to do it tastefully that would flow with the scene. The "swoosh" or trail of the top x-wing might look a little too plain. I thought of adding a colored gradient to the white, but I don't have any gradients elsewhere, and the late 70s and 80s cabs didn't use them to my knowledge. I also debated using the puke green/yellow on the x-wings, but in the end I included it to add a little color. I don't want it to feel too muted with grays and black. I also thought of adding flames or something to the bottom x-wing's thrusters, but nothing I came up with looked good to me. I just thought, "The Xevious artwork doesn't have that, so why should mine?" lol. Everything was done in Inkscape. So what do you guys think? What looks good/what should I change? Thanks for looking! Thanks, actually my cabinet is finished Check my signature link if you'd like to take a look. Great side art graphics! 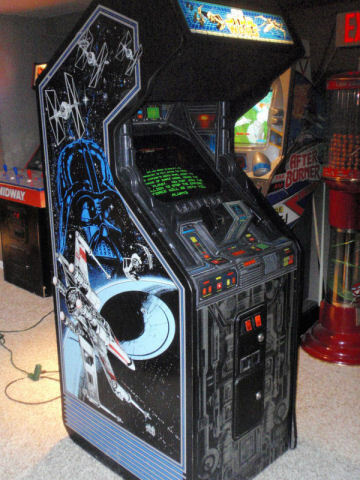 Really has that old school arcade vibe going on and great throwback to the original Star Wars cab below, but still with it's own identity, very nice. I like it with the logo included best, but without looks great as well. I want to make my own money! I like it with the logo. Awesome work! Only thing you might want to do is change the lasers on the X-wing as they are suppose to be green. I don't know why, but in my mind you had yet to install the side art. lol. Your cabinet looks fantastic. I totally thought that, too, before this project. Actually, the tie fighters (and rest of the empire vehicles if I remember) have green lasers. The rebels' vehicles have red. It's weird that they would reverse the colors like that since the lightsabers are the opposite. [/quote]I stand corrected. Me being a big SW geek I totally forgot the empire lasers were green. Good catch! Looking really good! I honestly think you can go either or on the art, but would lean towards with logo, if I had to choose. I'll be posting an updated picture of the art for my cab soon, also drawing inspiration from the Echo Base cab and other classics. Just curious could you take a close up picture of the piano hinge from the outside of the CP ? I'll probably be using one as well, but want to see how visible the hinge is from the outside. Keep up the excellent work. If it were me I'd 86 the logo, doesn't feel right to me. Smh at green lasers... c'mon man everybody knows xwing lasers are red. I think that sideart is perfect without the logo. It doesn't need a logo to balance it out, the design carries the eye up the side of the panel just fine and the logo gets in the way IMO. Here's a picture from the outside. You can see it if you bend down or from afar, but not when standing close to it. It's pretty well hidden painted black, but I don't mind if hardware shows a bit as long as it doesn't stand out like a sore thumb. Of course, you can make adjustments during installation to show less or more of it as you prefer.